This week has brought more turmoil in the global Emerging Markets and this has caused a number of EM central banks to move to hike interest rates to “defend” their currencies (despite most Emerging Markets today officially have floating exchange rate regimes). Most notable the the Turkish central bank on Tuesday in a desperate move hiked its key policy aggressively. So far the aggressive actions from EM central banks around the world have done little to calm nerves in the global markets. I have in a number of posts warned that this fear-of-floating can have a rather catastrophic macroeconomic and financial impact and that central bankers in Emerging Markets need to remain committed to the floating exchange rate regimes. Indeed I think central bankers need to learn a lesson from history. In that regard I think it is illustrative to look at the experience of two countries, which had floating exchange rates and inflation targeting regime during the Asian and Russian crisis in 1997-98. I will here look at the conduct of monetary policy by the Reserve Banks of New Zealand and Australia in this period. While the two Reserve Banks had very similar policy frameworks they reacted very differently to the external shocks in 1997-98. I will illustrate this with four graphs. Four graphs that today’s central bankers in Emerging Markets should study very closely to avoid repeating past mistakes. In a very similar fashion to today’s sell-off in Emerging Markets currencies in a number of countries came under serious depreciation pressures in 1997-98 as the both the Asian and the Russian crisis played out. That was also the case for the Australian dollar – the Aussie – and the New Zealand dollar – the Kiwi. Hence, during 1997-8 both the Aussie and the Kiwi weakened by 25-30%. The sharp depreciation of the Kiwi and the Aussie caused inflation fears to increase. The Reserve Bank of New Zealand feared that a weaker currency would push up inflation as a result of higher import prices. On the other hand the Reserve Bank of Australia was more concerned with the negative impact of the negative shock to demand coming from a collapse in external demand. This different perceptions of the risks led to different policy responses. 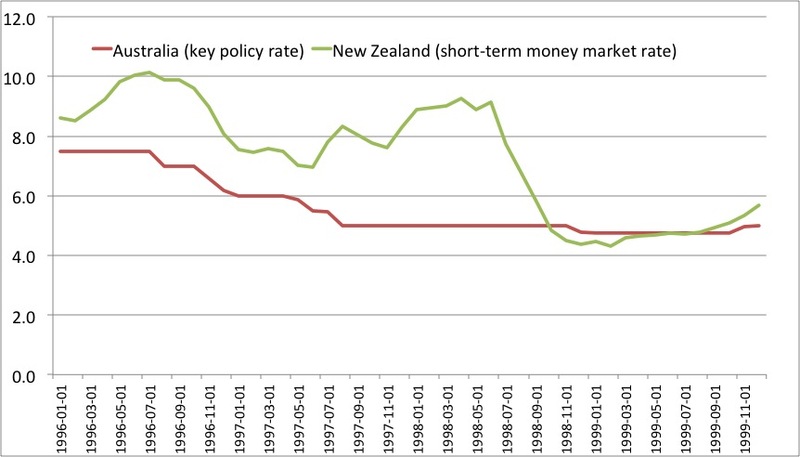 Hence, the RBNZ reacted by pushing up interest rates during 1997 (only later to reverse its policy stance sharply in 1998), while the RBA kept its key policy rate on hold all through 1997-98. It is also notable that these very clear differences in interest rate developments did little to change the performance of the Kiwi compared to the Aussie. This indicates that aggressive rate hikes will not help much if you want to prop up your currency in such environment. Hence, during 1997 there was a marked difference in the development in monetary conditions in the two countries. However, it is notable that there was very little difference in the inflation performance of the two countries. 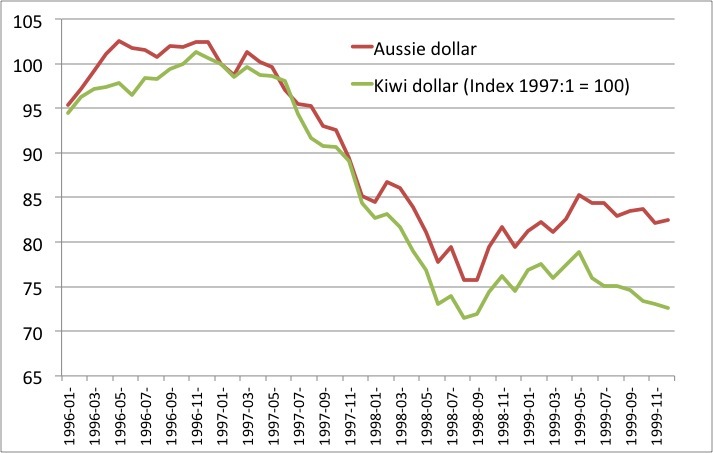 Despite the sharp sell-off in both the Kiwi and the Aussie inflation remained low and below 2% in 1997-98 in both countries and it is very clear that the “import price effect” was nearly irrelevant compared to the negative demand effect. While there was very little difference between the inflationary developments in the two countries in 1997-98 the story was very different when it comes to real GDP growth. Hence, the graph below very clearly illustrates that the RBNZ’s interest rate hikes caused the New Zealand economy to go into recession. Obviously the RBNZ claimed that it was the result of the negative external shock. 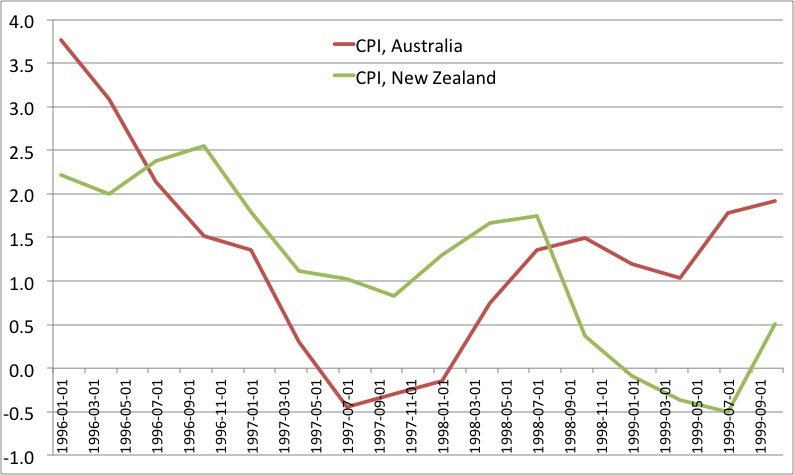 However, looking the what happened in Australia it is very clear that the recession in New Zealand was a result of monetary policy failure. In fact the RBA by not panicking and keeping its key policy rate unchanged ensured that recession was avoided in Australia despite being as negatively hit by an external demand shock as New Zealand. This very clearly demonstrates that the central bank has the final word when it comes to nominal spending/aggregate demand in the economy. Any negative demand shock – whether a shock to exports or fiscal tightening – can be offset by monetary policy. The RBA seems to have understood this, while the RBNZ failed to understand it – which rather negative consequences. The conclusion from the experience in 1997-98 in Australia and New Zealand seems clear – there is very little to gain from fighting a currency weakening caused by a major negative shock and monetary tightening in respond to such a shock is very likely to be recessionary. 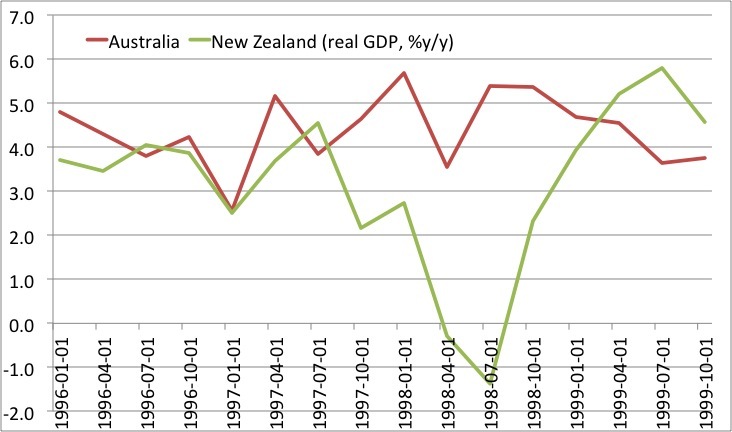 This week’s monetary tightening in Turkey is much bigger than what we saw in New Zealand in 1997 and it is therefore only natural to think that the impact on Turkish real GDP could be at least as negative as was the case in New Zealand in 1997-98. Therefore, the Turkish central bank (TCMB) should of course reverse cause as fast as possible. Yes, inflation is likely to increase as a result of a weaker lira, but the monetary policy response could also send the Turkish economy into recession. Central bankers in Emerging Markets should stop fighting the depreciation of their currency and instead focus on their medium-term nominal policy objectives. Stop-go policies as presently being implemented in Turkey are likely to end in tears. Instead EM central bankers should stay calm and let markets determine exchanges like the Reserve Bank of Australia did in 1997-98 and then it is likely that they will avoid importing recessions and financial distress and at the same time any major risks to their nominal policy objectives in the medium-term. I have an up-ed in today’s edition of UK’s City AM on the risk of major monetary policy mistakes – a repeat of the 1997 Asian crisis – in Emerging Markets in response to the recent currency sell-off across the EM universe. THE EMERGING market sell-off has prompted central bankers to act. Yesterday, South Africa’s central bank raised its benchmark interest rate by 0.5 per cent to 5.5 per cent, citing the depreciation of the rand and an increased risk to the country’s inflation outlook. The Reserve Bank of India has also increased its benchmark rate by 0.25 per cent to 8 per cent. Most unprecedented of all, however, was the Turkish central bank’s decision late on Tuesday to hike its key policy rate from 4.5 per cent to 10 per cent in response to the recent sharp sell-off in the Turkish lira. …the interest rate hike this week suggests that Turkey now fails to realise quite how high the cost of a pegged exchange rate regime can be. The central bank’s attempt to prop up the lira by aggressively tightening monetary conditions is effectively an attempt to quasi-fix the exchange rate – and we will likely see the same kind of negative growth effects as if there had been an actual pegged exchange rate regime. Obviously, Turkey has not returned to a pure pegged exchange rate. But trying to curb the sell-off in the lira in this stop-go fashion is likely to have a similarly damaging effect on growth. Ultimately, if the Turkish central bank continues to seek to prop up its currency, the end result will be serious financial distress as well. I certainly hope that Turkey’s desperate monetary tightening was a one-off. I equally hope that emerging market central bankers more generally realise that the best way to avoid a repeat of the 1997 Asian crisis is to allow exchange rates be determined by the markets. Otherwise, ill-informed central planners risk turning emerging market volatility into something much more worrying. Helping the lira, killing the economy? I never thought it would happen–perhaps I’m slipping. But as I was preparing to bang-out this post, my first in over a month here, I discovered that, a couple hours ago while I was toiling away in class, Paul Krugman stole my thunder. Krugman rightfully pours scorn on Prescott’s assertion, which states a “scientific fact” only in the peculiar sense that distinguishes such facts from ordinary, unqualified, plain-old facts, that is, the sort of facts one might glean from experience. A “scientific fact,” apparently, is not such a grubby affair. It is, rather, something much more pure, even virginal; it is a fact implied by a theory. The theory in this case is of course the “real business cycle” theory for which Prescott (and coauthor Finn Kydland) are famous. 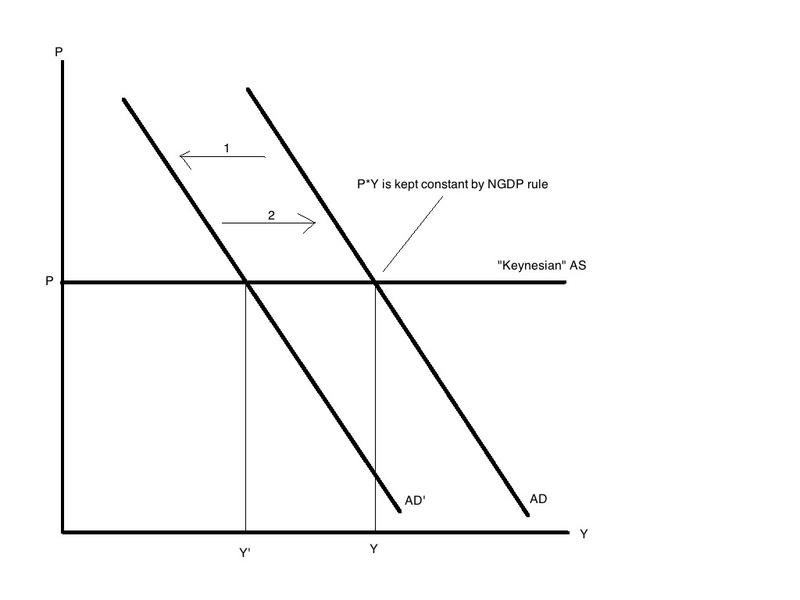 The theory starts with the New Classical premise that prices always adjust instantly to their general equilibrium levels, thereby all but eliminating any scope for real consequences of monetary disturbances. It then proceeds–hey presto!–to the conclusion that, if real variables bounce around, they must do so in response not to monetary but to real shocks. It follows, as a matter of logic, that the world economy must have met with a whale of an adverse supply shock in the 1930s. What shock, you wonder? What difference do such details make? There had to be a big bad shock, dontchyasee: the theory proves it. If the historians and econometricians can’t find it, well, so much the worse for history and econometrics. I can understand George. I have had the same awkward feeling of agreeing with Krugman on numerous occasions. I probably feel less uncomfortable about it than George – maybe I have gotten used to it.This is of course a bit of fun, but the point is that monetarists and market monetarists and economists who think like us (including Free Bankers like George) think that money is hugely important for the economy. In our view both inflation and recessions are monetary phenomena. This also mean that we tend to stress the demand side of the economy when think about the business cycle. Keynesians like to talk about aggregate demand, while monetarists like to talk about nominal spending, but it is really the same thing. 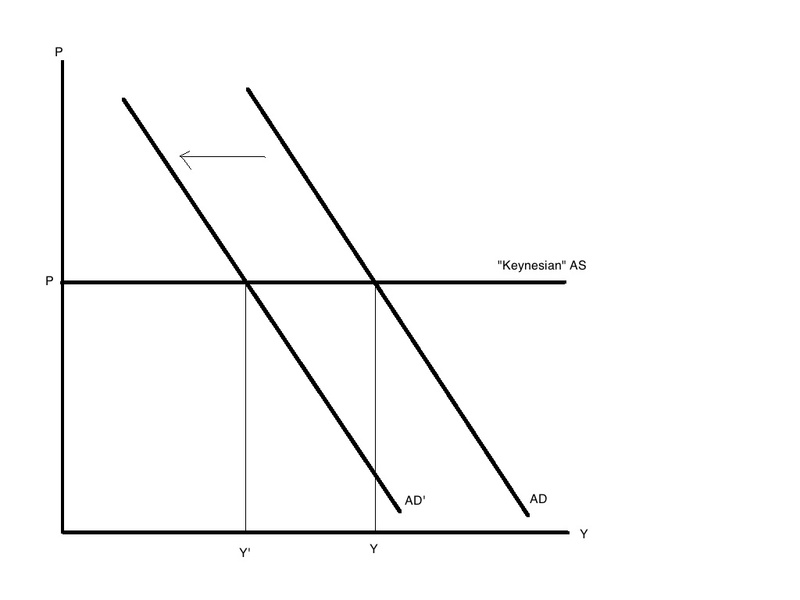 Furthermore, (Market) Monetarists and Keynesian agree that the present crisis is mostly a result of a contraction in aggregate demand (monetarists would say monetary tightening). PS As I have stressed before all the different models of the business cycle are basically about different assumptions about the monetary policy rule. Hence, we would in fact be in something, which looked like a Real Business Cycle world if the central bank targets nominal GDP. So if the central bank had got it “perfectly right” then Prescott would have been sort of right, but we of course know that central banks tend to get it horribly wrong. I have talked and written about China as a global monetary superpower before and I think it is useful to repeat (part of) this story to help better understand what presently is going on in Emerging Markets. … China can act as a monetary superpower and determine monetary conditions in the rest of the world, but also that this is only because central banks in the rest of world … allow this to happen. Malaysia or Hong Kong do not have to import Chinese monetary conditions. Hence, the central bank can choose to offset any shock from Chinese monetary policy. This is basically a variation of the Sumner Critique. The central bank of Malaysia obviously is in full control of nominal GDP/aggregate demand in Malaysia. If the monetary contraction in China leads to a weakening of the ringgit monetary conditions in Malaysia will only tighten if the central bank of Malaysia tries to to fight it by tightening monetary conditions. Update 1: The Turkish central bank did not listen to me and instead hiked interest rates very aggressively – trying to stabilize the lira, but likely also killing growth. Recession can no longer be ruled out in Turkey. See my day-job comment on the Turkish ultra aggressive rate hike here. Update 2: David Beckworth has an excellent comment on Ambrose and me. Read it! After it was David who came up with the term monetary superpower. Emerging Markets are once again back in the headlines in the global financial media – from Turkey to Argentina market volatility has spiked from the beginning of the year. The renewed Emerging Markets volatility has caused some commentators to claim that the crisis back. It migtht be, but also I think it is very important to differentiate between currency movements on its own and the underlying reasons for these movements and in this post I will argue that currency movements in itself is not necessarily a problem. In fact floating exchange rate regimes mean that the currency will move in response to shocks, which ideally should reduce macroeconomic volatility. I think it is illustrative to think about what is going on in Emerging Markets right now by imagining that the dominant monetary and exchange rate regime had been pegged exchange rates as it was back in 1997 when the Asian crisis hit. Lets take the case of Turkey and lets assume Turkey is operating a pegged exchange rate regime – for example against the US dollar. And lets at the same time note that Turkey presently has a current account deficit of around 7% of GDP. This current account deficit is nearly fully funded by portfolio inflows from abroad – for example foreign investors buying Turkish bonds and equities. As long as investors are willing to buy these assets there is no problem. But then one day investors decide to close down their positions in Turkey – for example because of they expect the dollar to appreciate because of the Federal Reserve tightening monetary conditions or because investors simply become more risk averse for example because of concerns about Chinese growth. Lets assume this leads to a “sudden stop”. From day-to-day the funding of Turkey’s 7% current account deficit disappears. Now Turkey has a serious funding problem. Turkey either needs to attract investors to fund the current account deficit or it needs to close the current account deficit immediately. The first option is unlikely to work in the short-term. So the current account deficit needs to be closed. That can happen either by a collapse in imports and/or through spike in exports. To “force” this process the central bank will have to tighten monetary conditions dramatically. This happens “automatically” in a fixed exchange rate regime. As money leaves the country the lira comes under pressures. The central bank will then intervene in the market to curb to the currency from weakening thereby reducing the foreign currency reserve and in parallel the money base drops. The drying up of liquidity will also send money market rate spiking. This is a sharp tightening of monetary conditions. The result is a collapse in private consumption, investments, asset prices and increased deflationary pressures (inflation and wage growth drop). An internal devaluation will be underway. The result is normally a sharp increase in public and private debt ratios as nominal GDP collapses. This process will effectively continue until the current account deficit is gone. This would cause a massive collapse in economic activity and as asset prices and growth expectations drop financial distress also increases dramatically, which could set-off a financial crisis. This is the kind of scenario that played out during the Asian crisis in 1997, but it is also what happened in Turkey in 2001 and forced the Turkish government to eventually give up a failed pegged (crawling) peg regime. Compare that to what has been going on the Emerging Markets over the past 6-7 months. We have seen widespread sell-off in Emerging Markets and yes we have seen growth expectations being adjusted down (mostly because some EM central banks have been fighting the sell-off by tightening monetary policy). BUT we have not seen financial crisis and we have not seen a collapse in Emerging Markets property markets. We have not seen major negative spill-over to developed markets. Hence, the sell-off in Emerging Markets currencies cannot be called a macroeconomic or a financial crisis. In fact the sell-off in EM currencies means that we have avoided exactly the 1997 scenario. That is not to say that everything is fine. It is not. Anybody who have been following the still ongoing corruption scandal in Turkey or the demonstrations in Ukraine and Thailand know these countries are struggling with some real fundamental political and economic troubles. In fact I fear that a number of Emerging Markets countries at the moment are seeing an erosion of their long-term growth potential due to regime uncertainty and general macroeconomic mismanagement. But we are not seeing an unnecessary economic, financial and political collapse induced by a foolish exchange rate regime. Luckily most Emerging Markets today have floating exchange rate regimes. So yes, I believe we – and the populations in most Emerging Markets – are lucky that fixed exchange rate regimes mostly are a thing of the past in Emerging Markets today, but unfortunately it is not all Emerging Markets central bankers who have learned the lesson. Hence, many central bankers still suffer from a fear-of-floating. Just take the Turkish central bank (TCMB). On Tuesday it will hold an emergency monetary policy meeting to discuss measures to curb the sell-off in the lira. Officially it about ensuring “price stability”, but the decision to have an emerging meeting only a week after a regular monetary policy meeting smells of desperation on part of the TCMB. It is widely expected that the TCMB will hike its key policy rate – the market is already pricing a rate hike in the order of 200bp. If the TCMB delivers this then it will only have marginal impact on the lira – if the TCMB delivers more then it could prop up the lira at least for the short-run. But a larger than expected rate hike would also be constitute monetary policy tightening and given the present sentiment in the global Emerging Markets the TCMB likely will have to do something very aggressive to have a major impact on the lira. And what would the outcome be? Well, it is pretty easy – we would get a major contraction in Turkish growth to well-below potential growth in the Turkish economy. Given the fact that inflation expectations (24 month ahead) is around 7% and hence the TCMB official 5% inflation target there might certainly be a need for a moderate tightening of monetary policy in Turkey, but should that happen as an abrupt tightening, which would send the Turkish economy into recession? I think that would be foolish. The TCMB should instead try to get over its fear-of-floating and focus on ensuring nominal stability. It is failing to do that right now by pursuing what mostly look like 1970s style stop-go policies. Luckily the stop-go policies of TCMB is no longer the norm for Emerging Markets central banks who generally seem to understand that the level of the exchange rate is best left to the market to determine. PS see also my preview on Tuesday’s Turkish monetary policy meeting here. PPS This post is about value of floating exchange rates and even though I think floating exchange rate regimes now substantially reduce the risk of major Emerging Markets financial and economic crisis I am certainly not unworried about the state of Emerging Markets. I already noted my structural concerns in a number of Emerging Markets, but I am even more worried about the monetary induced slowdown in Chinese growth and I am somewhat worried that the PBoC might “mis-step” and cause a major financial and economic crisis in China with global ramifications particularly is it fails to keep the eye on the ball and instead gets preoccupied with fighting bubbles. Update: My friend in Malaysia Hishamh tells the same story, but focusing on Malaysia. …While supply-side reforms are usually helpful and fiscal integration may help some eurozone states, Europe’s main problem is monetary. Nominal spending has collapsed in the eurozone since 2008 and is still well below its pre-crisis trend level. As a result, Europe’s unemployed face a problem of musical chairs: too many jobseekers chasing too little money. The eurozone’s best hope is for the European Central Bank to pursue a more expansionary monetary policy to raise nominal spending in the eurozone to its pre-crisis trend level, and commit to a nominal spending target thereafter. Monetary chaos is the source of Europe’s woes: only monetary stability will overcome them. I fully agree. The ECB can end the European crisis tomorrow by introducing a nominal spending target. Even a very modest proposal of 4% nominal GDP growth targeting would do the trick. Unfortunately nobody in Frankfurt or Brussels seems to be listening. The “normal” story of the Great Recession is that the crisis was caused by the bursting of a giant property market bubble in the US and other places. The normal story is an odd synthesis between a old-school Keynesian animal spirits story and a vulgar version of Austrian business cycle theory. Market Montarists have long argued that the crisis was not a result of a bubble bursting, but rather a result of a monetary policy disorder – a unwarranted massive tightening of monetary conditions in both the US and the euro zone (and other places). Market Monetarists, however, have paid less attention to whether or not there in fact was a bubble – and we do not necessarily agree on this. Scott Sumner and Marcus Nunes are quite critical that there was a bubble in the US property market, while David Beckworth and myself are more open to the idea that there might have been a bubble (whatever that is). Personally, I also focus on other countries than the US where I believe it is fairly obvious that there were substantial misallocation, which also manifested itself in a “bubble” in the property market. I certainly believe that that was the case in the Baltic States, Iceland and Spain. That said, that was not the cause of the crisis and therefore I would tend to downplay the importance of these “bubbles”. Even though I believe that there might have been bubble in some countries prior to the crisis I am very critical about the normal story of widespread bubbles and that these bubbles were what caused the crisis. In recent days there have been put out a number of blog posts that all seem to show that there was no bubble prior to the crisis. I think it is worthwhile reading all of these posts. We start out with Marcus Nunes post “Excuses Galore” from July last year on the US property market. Marcus’ post has inspired Adam Smith Institute’s Sam Bowman to write a post on why “There was no British housing bubble”. Sam has a follow-up post – “Bubble and a ballons”. Finally you should read Harry Flam’s post on why there is no Swedish property market bubble. Maybe I should write a post on why Danish property price indeed were (too) high prior to the crisis, but that it hardly was a bubble and the crash was not caused by a bubble bursting, but because of monetary tightening…but that will have to wait.